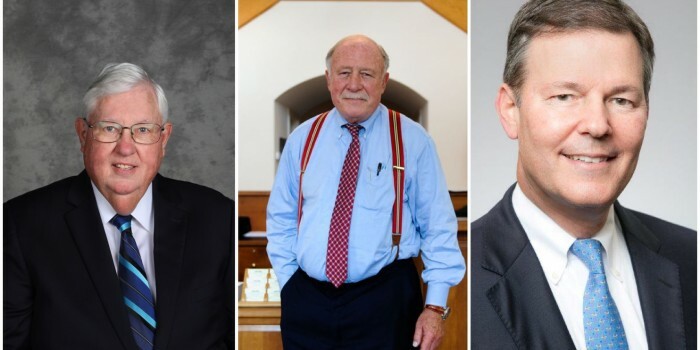 A number of Wake Forest Law alumni, including the Honorable Richard L. Doughton (JD ’71), Marc L. Isaacson (JD ’82) and James R. Van Camp (JD ’65), received awards at the 118th Annual Meeting of the North Carolina Bar Association (NCBA) on June 24, 2016. The annual meeting consisted of various award ceremonies, candidate forums, receptions, legal education programs and more from June 23-26 in Charlotte. Doughton, Isaacson and Van Camp were recipients of the NCBA Citizen Lawyer Award. The Citizen Lawyer Award, presented by the Citizen Lawyer Committee, recognizes attorneys who demonstrate the ideals of a citizen lawyer through volunteer work and civic involvement in their communities. Judge Doughton of Sparta has served as a special Superior Court judge since 1997, having previously operated a one-man firm in Sparta. He has been a member of the NCBA’s Administration of Justice Committee, the Transitioning Lawyer Committee, the Bench Bar Committee and the Rural Courts Commission. Doughton also served as Alleghany County Attorney, the Town Attorney for Sparta, the attorney for the Alleghany County School Board, the president of the local bar and judicial district bar, the chairman of the Board of Blue Ridge Bank, a member of the Board of Legal Services of the Blue Ridge and a member of the State Bar Disciplinary Hearing Commission. Isaacson of Greensboro is a partner at Isaacson Isaacson Sheridan Fountain & Leftwich, LLP and a past member of the North Carolina Bar Association’s Real Property Section Council. He has served as a member and chairman of the Guilford County Board of Elections, a member of the Greensboro War Memorial Coliseum Commission and a member of the Greensboro Parks and Recreations Commission. Isaacson has also served on the board and as chairman of the Greensboro Natural Science Center, Inc. and on the board member and as past president of Temple Emanuel Greensboro. Isaacson has worked as pro bono legal counsel for the Wyndham Open and to the Carolinas Section of the Professional Golfers’ Association (PGA) of America. Van Camp of Pinehurst is a partner at Van Camp, Meacham & Newman, PLLC. He is a member of the American Academy of Criminal Defense Attorneys, the American Board of Trial Advocates, the Association of the Trial Lawyers of America, the Commission for the Future of Justice and the Courts and Wake Forest Law’s School Board of Visitors, among others. Van Camp has also previously served as president, vice president and on the Board of Governors of the North Carolina Academy of Trial Lawyers, as well as chairman and vice chairman of the Governor’s North Carolina Crime Commission.